Do lavender differently, with the beautiful Ellagance Pink. You'll grow compact, well-branched plants with highly fragrant baby pink blooms that look great with purple flowered varieties. Long flowering, perennial plants and fully winter hardy. Flowers July-September. Height 30-40cm (12-16"); spread 20-30cm (8-12"). GROWING - For flowering the first year, sow your seeds early in the year in a propagator using a good quality, moist seed compost and place on a windowsill or in a greenhouse at approximately 15°C (60°F) to germinate (usually 20-90 days). Alternatively sow in a well-raked seedbed outdoors April-June 3mm (1⁄8") deep and cover lightly with soil. Transfer to a site in full sun or partial shade in autumn for flowering the following year spacing the plants 41cm (16") apart. Ideal for beds and borders, patio pots and containers, raised beds. Suitable for cutting and drying. Scented. Attractive to bees and butterflies. 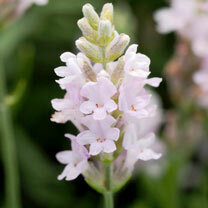 HINT: Lavenders perform best when pruned every year to keep them in a tidy shrub form. Pruning should be done every year in late summer when the blooms have faded so that the plants have time to put on new growth before winter.